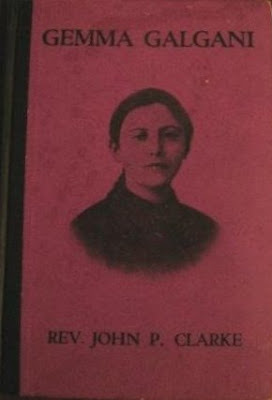 Thanks be to God I just acquired a very rare out of print book on Saint Gemma entitled- "Gemma Galgani: Some Glimpses into the Life of a Little Victim of Divine Love." by Father John P. Clarke, Benzinger Brothers, 1932. And so I hope to use this book to create a new article or two for this website, God willing. And I must say I love the title -"Gemma Galgani: Some Glimpses into the Life of a Little Victim of Divine Love"...for Gemma was very much a "little victim of Divine love", who was not only a remarkable Saint who lived an extraordinary holy life full of love and devotion to Jesus and Mary, but she was a victim soul, who bore the stigmata and the crown of thorns in union with Jesus for the conversion of sinners. From the moment that Jesus appeared to her covered with wounds and wearing the crown of thorns Gemma intensely longed to help Him in the conversion of sinners that is, the redemption of humanity. She did indeed become so steeped in the Passion of Christ that she once said: 'I am fruit of Thy Passion, a flower of Thy Wounds." And now, in this present time, she is also a very extraordinary advocate and heavenly friend for those who seek her help and intercession, as the countless emails and letters to my inbox over the past few years can attest, just as a small example. "Oh to Paradise! Let us go to Paradise where we shall see God as He is, in all His entirety. When oh my God will You take me to Paradise?" And Jesus answer came on Holy Saturday, 1903, when after suffering her last Good Friday in her bed of pain as a victim soul united with Jesus in the love of souls, the Divine Lover came and called her to Himself. Consumed with love rather than disease, she flew to His loving embrace. And as Little Victim of God's Love, she now sees Him face to face. And her plea and desire for us is that we may learn to love Him like wise." (from "Gemma Galgani" by Rev. John P. Clarke). Gemma once said "May I die, and may I die of love. What a beautiful death, oh Lord, to die a victim of Your love, a victim for You!" -And now dear Gemma that you are with Jesus your Divine Love, do not forget us who remain here below in this vale of tears, and obtain for us from Jesus the graces and heavenly help that we need. Teach us how to sacrifice and suffer out of love for Jesus like you did. Guard and protect us from the evil one, and enlighten us against his evil traps and temptations. Inspire and guide us throughout our earthly days, that we may always do God's will, that we may always be pleasing to Jesus and Mary. Help us to love God with all of our hearts, and be with us always, especially in our last moments, and when we breath our last breath, present us to Jesus, and plead His mercy upon us, that we may be united with Jesus, Mary and you for all eternity. ~St Gemma, pray for us! ***Update: Here is a article with excerpts from the book.